You control the amount of time students should spend, not the number of questions. And Yacapaca measures the time directly; it does not pretend some equivalence of questions to timing. As well as questions from the topic you selected, students will also meet a random selection from topics previously covered in class. If you set Yacapaca homeworks consistently regularly, you will be able to exploit the Ebbinghaus effect to make sure students don’t forget previous topics as fast as they learn new ones. Homeworks are only available on syllabi for which we have a defined topic list, and with student sets that are linked to one such syllabus. 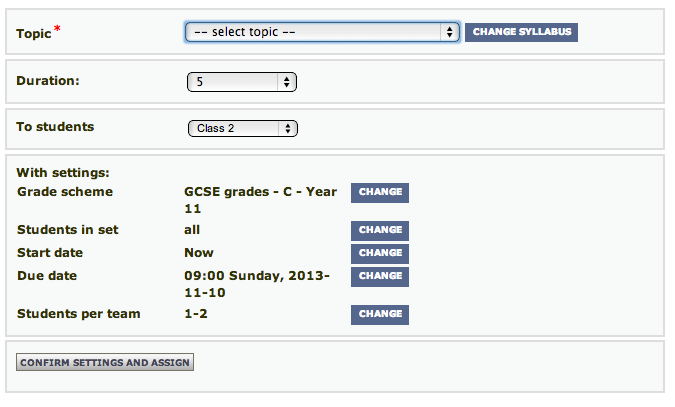 Now you can assign Homeworks direct from the Gradebook. Here’s how. The Topics dropdown lists all the topics defined in the syllabus. Duration is in minutes. Students actually need a little longer than the time you set, because the timer stops for them to read the formative feedback. I recommend you start with just 5 minutes, and build up from there as students get comfortable with how it all works. All of the other settings are the same as for quizzes, may be safely left on the defaults. And that’s it! You can set a really valuable homework in just 6 mouseclicks, and watch the results appearing in your Assignments list. This entry was posted in Yacapaca and tagged computer adaptive testing, Ebbinghaus, formative assessment, homework, quiz. Bookmark the permalink.